A bit of a rarity, a peated Yamazaki! Distilled in 1993, bottled in 2008 (according to math that's 16 years) at 62% vol and limited to 503 bottles. Aged in a White Oak Puncheon cask. 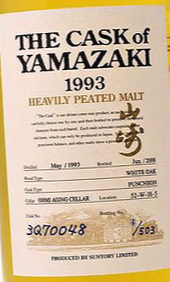 Comments: The peaty Yamazaki works excellent! And the peat isn't overpowering to the more subtle Yamazaki flavors out of the white oak cask. Very well worth trying if you run across a peated Yamazaki.